Is it just me or did last week drag on like nobody's business? Filled with errands or not, the weekend was a welcome relief. We're still a ways off from being finished, but the new apartment is feeling much less like a sea of boxes and more like something actually lives there. It is important to note that I am sitting on the living room rug to write this because we finally put it down, for good! After a week off from blogging, it would appear that I have definitely forgotten how to pose for outfit photos, but that's always been an awkward thing. Sunday, yesterday, we did some experimenting with shooting indoors against our very blog friendly white brick wall before heading out to brunch and finishing up some miscellaneous errands. This is an outfit I expect to be on repeat until it gets too hot to comfortably wear pants. I'm always a fan of stripes and so I doubled up. I had these espadrilles on my wishlist last summer but they sold out before I could get my hands on them. I was not missing the boat this year and so I have been patiently waiting to wear them for about a month now. boden top . rich and skinny pants . soludos espadrilles . gorjana bracelet (via rocksbox - use code "proseccointheparkxoxo") . catbird and virginie millefiori rings . julep nail polish in "shawn"
Also, wanted to share this video as it pretty much sums up my thoughts on my previous upstairs neighbors. Elephant bowling, "whacky Wednesday", and the laughing man are things I will not miss. Don't get me started on the occasional indoor rain. On that note, Happy Monday and thank you for reading. Yay for partially getting settled in to the new place. Its definitely a process but it sounds like you guys have made a lot of progress so far! And I feel you on the awkward posing! I had the same issue this weekend haha! 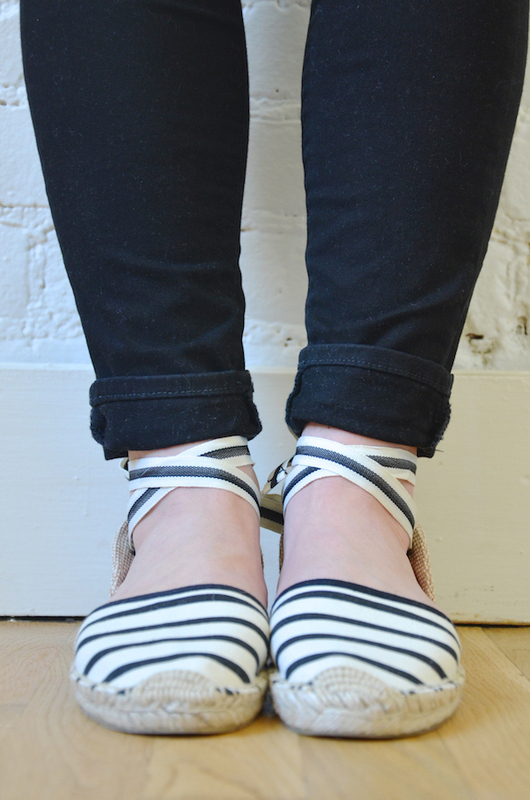 Love the stripes and those espadrilles are amazing! I love the double use of stripes, so classic chic! 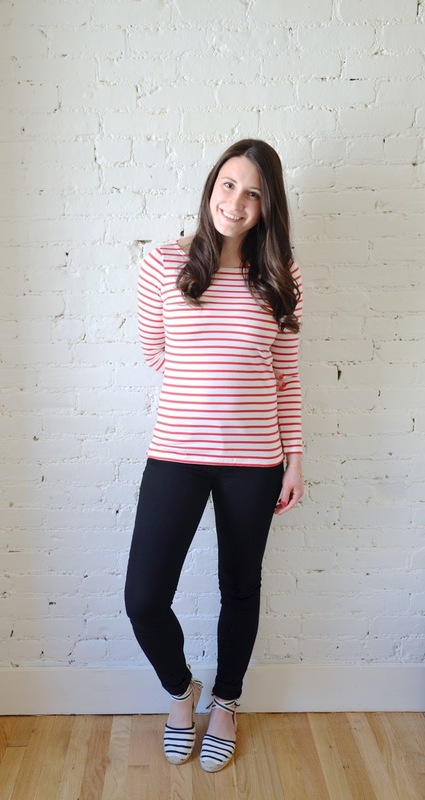 Stripes are my favorite classics! I love the mix-matched colors, too! Love the stripes. They are perfectly to scaled to your petite frame. You look so cute. HILARIOUS! So many hilarious videos today! This is another one that I stumbled upon. Amazing! And that white brick wall is really all I've ever wanted in an apartment. Great find! I love your stripes! I never met a stripe I didn't love! Those shoes are so freaking cute. 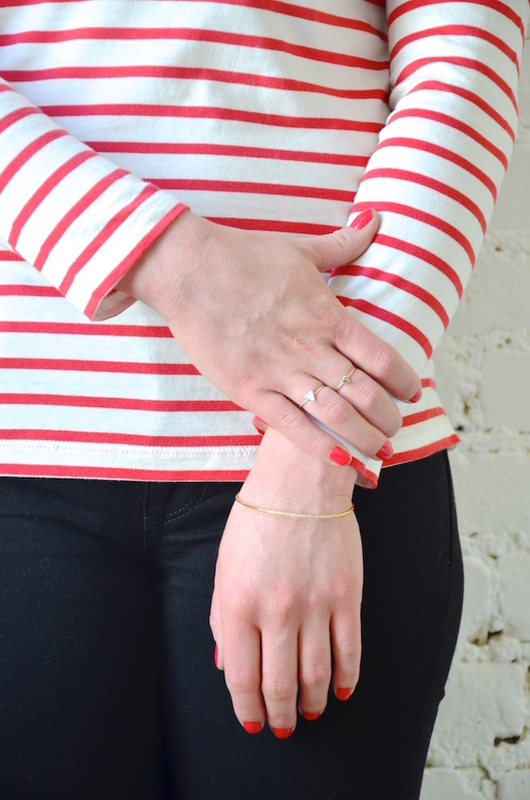 Love the combo of stripes! Those shoes are so perfect for this warmer weather! Love these stripes! So cute. Those espadrilles are just perfect! Simply perfect love this look!